If you love digging in the dirt and planting seeds, flowers and vegetables, you'll love stitching these 10 hand embroidery patterns inspired by the garden. In this round-up of designs, you'll find a variety of styles so you can "plant" some embroidery however you like. In Lewis Carol's Alice in Wonderland, Alice has a conversation with some flowers, and this free pattern by Little Dorrit & Co. captures what those flowers might look like. The sweet and simple faces are so charming that you're sure to enjoy your time stitching this whimsical garden! Gardens go through cycles throughout the year, and these sets of embroidery patterns reflect that. Each of the Year in the Garden patterns contains six designs, so you can stitch one each month. Every pattern has flowers of some kind, but you'll also find a garden gate, a birdhouse, a boot, tools and more. Reminiscent of a formal divided garden, this pincushion project from Fiberluscious gives you the opportunity to try out some fun floral stitching! The instructions themselves are divided over several blog posts: getting started, lavender-type stitches, mum stitches, sunflowers and daisies and hydrangeas, geranium, roses , and finishing. This is one stunning embroidered garden! 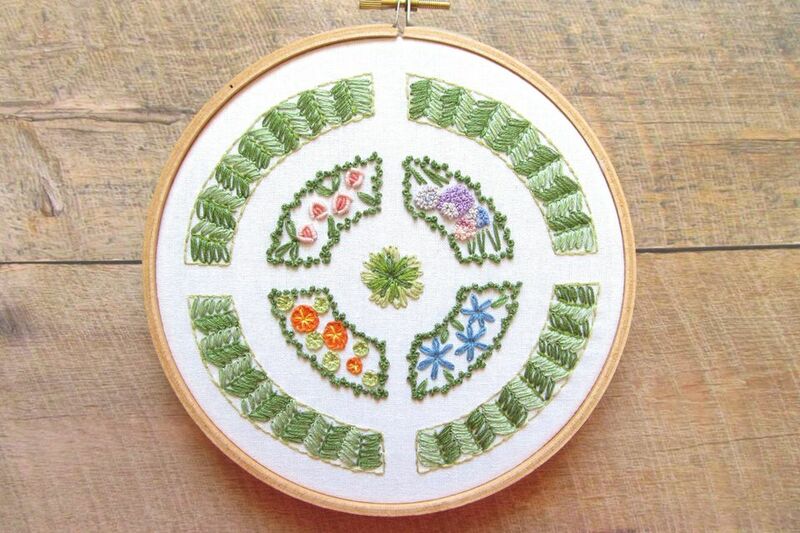 Bird Brain Designs offers a large embroidery pattern that's perfect for those who love gardening, quilts, and embroidery, or a combination of those! Quilts in the Garden is beautiful in red work as shown, but would look amazing in full color too. They even show how you can use smaller elements from the larger pattern on their own, which gives you the ability to really adapt and customize this pattern! Ready to grow some veggies while you learn some stitches? This free Vegetable Garden Sampler pattern incorporates 11 different stitches, allowing you to "grow" cabbage, carrots, squash, tomatoes and cauliflower. Because of the repeating elements, you'll get good practice with bullion roses, feather stitch, french knots and woven wheel stitch. Butterfly gardens contain an abundance of flowers that attract butterflies and this pattern from Carina of Polk and Bloom is sure to attract you! The circular Flutterby Garden design features bright florals and plenty of fluttering butterflies. Because it only uses a few basic stitches, it's suitable for stitchers of all experience levels. If you love formal gardens but aren't quite ready to plant one for yourself, be sure to check out Sweater Doll's English Knot Garden pattern. It features several types of flowers and really does look like a traditional knot garden viewed from above. Though not technically a garden, the bouquet in this free pattern from Down Grapevine Lane looks like it was freshly cut from an abundant flower garden. The Embroidered Bouquet pattern boasts several styles of flowers, which makes this a design that will keep you actively stitching. Plus, these are the kind of fresh flowers that will last for ages! Based on a phrase, and then a song, from Fred Rogers of Mr. Rogers' Neighborhood, this free pattern from Mollie of Wild Olive encourages you to "grow ideas in the garden of your mind." It's not an actual garden, but it's a fertile one, nevertheless! And the pattern itself has a garden of simply stitched florals. Anyone who has gardened knows that it takes work and the right tools. But it can also be a place of "sunshine and happy times," and the Gardening Hand Embroidery pattern from Happily After Designs combines all of those things. With a wheelbarrow of dirt, seeds, and gloves, along with a sweet phrase, this pattern is perfect for beginners.